The planned peaceful solidarity rally for Donald Trump converged by the Indigenous People of Biafra suddenly turned into a feast of genocide. Scores of Biafrans who stormed Portharcourt have lost their lives while the genocide is yet sustained at the time of this report. The rally turned into a feast of genocide when Nigerian security forces commanded by Muhammadu Buhari opened fire on the people who refused to be dispersed. On the side of the Biafrans; they have chosen to die instead of retreat on their planned solidarity rally for Donald Trump. “We suffered when Trump was campaigning and during his primary, our journalist wrote good things about him for Americans to support him. Our millions of online warriors ensured Trump’s messages reach everywhere. Our people in USA voted immensely for Donald Trump, CNN and other mainstream media were against him but the Biafra social media warriors fought and won. This is our victory and not even death will stop us from celebrating it. Buhari can kill all of us here today; our people are dying but we will never retreat on this rally” a Biafran activist strongly said to our reporter when asked won’t they retreat to save lives. 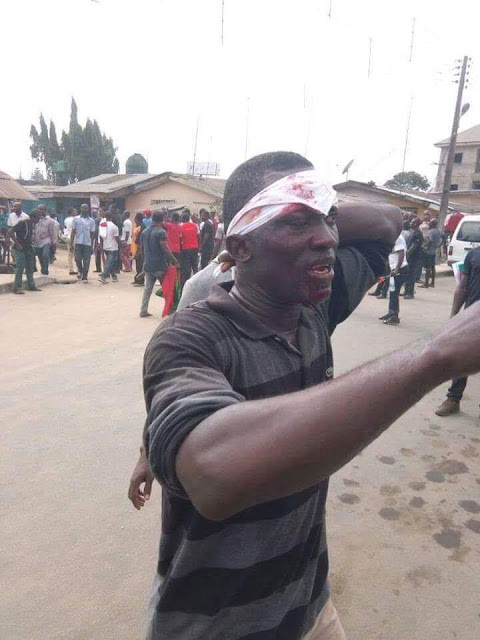 This situation was enough to make the rally a feast of genocide; the people of Biafra refused to leave and Muhammadu Buhari’s army decided to open fire and force the people to disperse. The people of Biafra are falling without constraint on the side of the soldiers who are supposed to be at the border killing intruders and invasive elements. Scores of Biafrans have been confirmed dead and arrested; while many have suffered or died of various degrees of injuries as a result of use of brutal force. Hospitals in Portharcourt are filled and rejecting further victims; Biafrans falling off fly-over in an attempt to escape sporadic gun shot. Stampeded recorded and as the time of filing thing report; the exact figure of casualties cannot be ascertained as figures are likely high. Nigerian security forces have saturated the city of Portharcourt; well armed and reinforcement coming at a particular interval to ensure Biafrans are sufficiently killed. The Nigerian leader Muhammadu Buhari sees Trump’s solidarity rally as crime in Nigeria hence Biafrans don’t have right to peaceful assembly or accepting whom he rejected. The slavery by force; courtesy of one Nigeria remains the reason Biafra have no right to their lives. To Muhammadu Buhari,ordinary Solidarity Rally for Donald Trump is a crime but he donated over $10 million dollars to a loser, Hillary Clinton campaign fund. This will show the world that Buhari is a Terrorist supporting fellow Terrorists and killing Trump supporters. It is Biafra or death.